For any electronic artist, liberation can prove to be something of a double-edged sword. The seemingly endless array of new software, plugins, and freshly discovered vintage hardware can mean you can get lost, deep in the rabbit hole all too quickly. The freedom afforded by having everything at an artist's disposal can all too easily detract from any vision they may have for the music. For LA-based techno and house producer, John Tejada, the key to his fourth album for Cologne-based Kompakt was in the setting of clear boundaries and restrictions and then seeing what could be achieved by exploring those limitations. On Dead Start Program, his follow-up to 2015's Signs Under Test, Tejada opted for a more streamlined approach or, as he defines it, "a limited studio setup". Coupled with this starker approach was a very clear idea of what he wanted to achieve. In this case his desire was to echo a "metaphorical reboot from the challenges life throws at you". The result is a sharp and clear tech-house album. One that contains all the polychromatic groove, and labyrinthine mix of meticulously crafted techno soundclashes of old but with a sharper focus. Eleven tracks that erase the fuzz and sharpen the senses. Opening track "Autoseek" finds Tejada sailing in more experimental waters. With spooky circulating washes of synths and fluctuating looped synth notes, it possesses a John Carpenter-esque sensibility in the way he manipulates suspense and tension. "Detector" is a little more characteristically 'John Tejada'. Featuring runaway house beats, punctured by illuminating synth chords, it feels like a track designed as a cognitive enhancer. Album standout, "Sleep Spindle", is a masterclass in nocturnal techno. Slow ripples of chords give way to a compact breakbeat as Tejada draws on all of his years of experience to create a heady mix of groove and technical wizardry. The more automated sounding "Hypochondriac" entrances with a metronomic pulse and layers of marching synth chords that gradually fuse together, interrupted by occasional flashes of white noise. It sounds like a track written by computers for computers. If "Hypochondriac" evokes a feeling of regimented, automated construction by machines, then "Loss" sees those machines going haywire. Here, Tejada blends a head-spinning, wondrous collage of techno loops and percussion that work towards some semblance of balance before veering away and spinning wildly out of control. There is an uneasy tension about it that repays repeat listening. Each track on Dead Start Program provides a technical masterclass from an artist drawing from a wide-range of reference but with the bravery to challenge himself. "The Looping Generation" is a heart-thumping, dancefloor gem. Tajeda loops rhythms that steadily grow, twist, and wind their way towards a clamorous apex before shrinking away again, to be deftly replaced with an equally exciting bubbling loop. There are more ideas on this one track than many artists have over the course of an entire album. Something that is even more remarkable considering how Tejada purposely limited himself during the making of the album. "Telemetry" finds Tejada working the synths to sound like whirls of machinery as if robots were taking part in a choreographed dance routine. "Duty Cycle" is a delightfully clean and clinical slice of uncluttered tech house. The phenomenal "All at Sea" builds on a heavy dub kick before becoming a turbulent storm of hit hat and snare. On its own, that would be enough, but Tejada adds a new twist on a classic idea by underpinning the beats with ambient jazzy chords. "Heal" repeats the trick by enclosing gleaming, trippy synths around live sounding drums and a thunderously deep, funky bass line. Fitting closer "Quipu" sees Tejada create a rich, cinematic soundscape only to scorch it with Violator-era Depeche Mode beats. 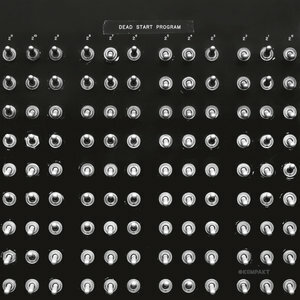 As a piece of work, Dead Start Program retains an overriding feeling of clinical detachment as each song is imbued with a distinctively mechanized edge. Nevertheless, it is a hugely enjoyable and engaging example of an artist energised by his own self-set limitations.